Unfortunately the March Dance had to be cancelled but Declan Gaynor is entertaining us on April 7th. There is something about a souful Irish voice that just melts! Some people just come to listen, not to dance, he is that good! Tickets will be at the usual price of £6 on the door and there will, of course, be a bar and barbecue. Just a reminder there is no caller, no line dancing or anything formal it is just an evening of good entertainment – and all for £6! On Friday 27th April we will be showing Paddington 2 and on May 18th the film will be The Greatest Showman. Please remember the May showing will be a week earlier than normal on the 18th because of the Art Show. Doors open at 7.00 pm and the film starts at 7.30 pm. Please visit the Cinema page on this site for full information and trailers. Get Easter off to a good start with the Duck Race at Earls Meadow on Saturday 31st March, what a fun morning that is. Ducks are £1.00 each and it’s fun for all the family (dogs are welcome too on leads please). Richard Whymark, comedian and ventriloquist is back (with a Fish’n’Chip supper) on 21st April 2018,. Tickets, which include the supper, are on sale at the Post Office or from Janne on 01284 828264 sales are going well so book early. We have to know numbers in advance to be able to order the supper and we expect there to be a high demand for this thoroughly entertaining evening. The 4th Annual Cockfield Art Show will soon be here! 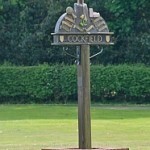 Artists are signing up daily to exhibit at the 4th Annual Cockfield Art Show which is on over the Whit Bank Holiday weekend of the 26th, 27th and 28th May. Entry is free, the Pop Up kitchen is fabulous and the art is unpretentious with something to suit all tastes and budgets! The Village Show is on 9th September and the ABBA tribute act on 17th November. There will also be a full program of Country & Western Evenings and Cockfield Community Cinema. Details of all our events will appear in Green Links as well as the Village website. Information is also circulated through our Community Council e-mail distribution list. If you wish to be included on the list, which is an excellent source of information about local events, please follow the link in the footer of any webpage on the site. The next waste paper collection will be on Sunday 29th April As usual, collections will start at 9.00 am. These collections are an important source of funds for the Community Council so please leave your papers out for the collectors. If you should find you have a lot of paper and card building up you don’t have to wait for the last Sunday in the month to off load it, paper and cardboard can always be dropped off at the Dutch Barn at Cockfield Hall.